As the name suggests, stress-corrosion cracking results from the combination of stress, which may be applied or internal, and corrosion by particular media, of which chlorides are of particular interest in yachting. The most common cause of stress that is high enough to lead to SCC is residual, generated internally by the production method. 300 series stainless steel is austenitic and cannot be hardened, which equals strengthened, by heat treatment. In their as-cast condition these steels are soft and weak, and unable to accommodate the loads that they are expected to bear. Boat components such as cable, shackles, chain plates, bottlescrews, connectors, etc., are manufactured by stamping, cold forging and extrusion, all methods that form it into its final shape, while increasing its strength considerably. Components manufactured in this way can have residual stress levels as high as the yield stress. Three types of media important in SCC are sulphides, chlorides and (for copper alloys) ammonia. Of these, chlorides are by far the most significant for us. Temperature is also important, the phenomenon occurring to a far greater extent above 50C. However, it also occurs at much lower temperatures, for example in implants in the human body. 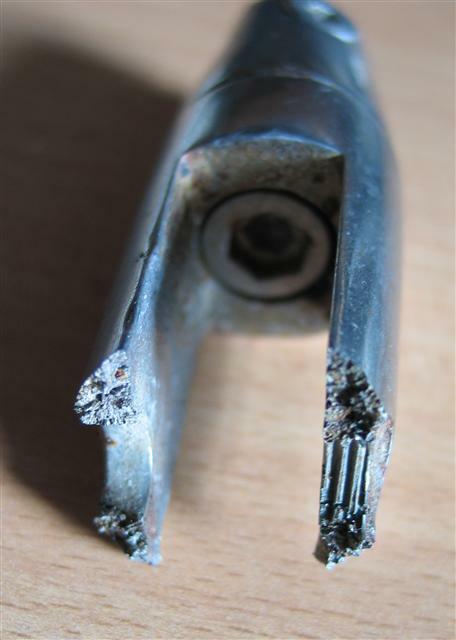 Stress-corrosion cracking occurs quite commonly in yacht components. Many of these are deck-mounted, never immersed in seawater but living in a chloride atmosphere. In many ways this is a more arduous duty than constant immersion because the concentration of the chloride is continually evaporated by sunshine and the overall temperature is considerably higher. The mechanism of stress-corrosion cracking is that chlorides penetrate the metal along the grain boundaries, producing a characteristic branched crack appearance in section. Good examples are shown here. When fracture occurs the resulting fracture face has a crystalline, or brittle, appearance due to separation along the chloride films along the grain boundaries. Fracture takes place instantaneously, releasing the stress, often with a loud bang. 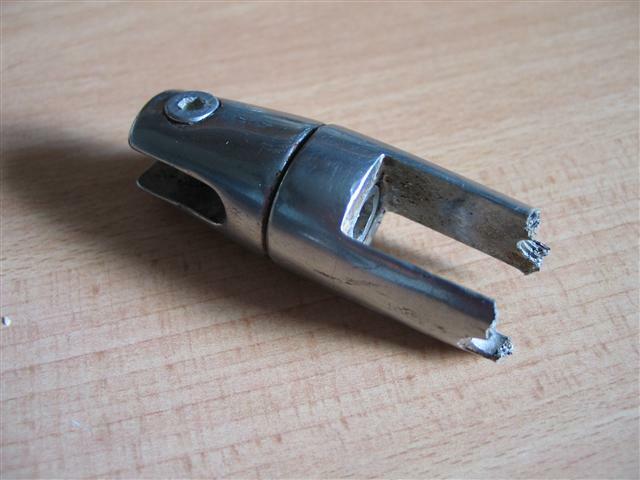 A fracture of the screwed side of a D-shackle. The appearance of the fracture face is crystalline, although some rusting has taken place since the fracture. This is a typical location for residual stress, where metal deformation in construction of the shackle is at a maximum. We were at anchor in San Antonio, Ibiza on a warm evening, wind about force 3, no tide. Depth of water was 2 – 3 metres, about 20 metres of chain out. There was a sudden bang from forward and we began drifting backwards. I hauled the chain in, to find this broken connector on its end. A closer view of the connector shown above. Another typical stress-corrosion fracture at regions where deformation during manufacture would be at a maximum. 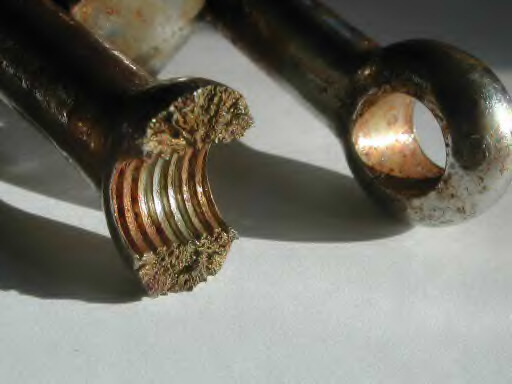 Interestingly the main body of the connector is relatively soft, the high hardness needed for the residual stress is very local to the fracture.